On Tuesday, March 30, 2010, a lecture entitled "The Influence of High Frequency Climate Variability on Paleoclimate Interpretation" will be given. It is described as "Understanding past long-term climate states can play an important role in helping to forecast future climate changes. This talk is a discussion of how these issues affect our understanding and interpretation of paleoclimate." This presentation is part of the American Association of Petroleum Geologists Distinguished Lecture series. The lecture will be given by Martin Perlmutter of Chevron (Houston, Texas) who has 25 years experience at Chevron and Texaco as research scientist and team leader. Lecture will be at the University of Kentucky campus, Mining & Minerals Resource Building (Rose Street), Room 102. Reception starts at 6 PM EST and lecture given at 6:30 PM. Sponsored by University of Kentucky, Kentucky Geological Survey, American Association of Petroleum Geologists, Kentucky Society of Professional Geologists, Morehead State Department of Earth and Space Sciences, and Eastern Kentucky University Department Geography and Geology. There is one more sponsor but I cannot read their name on the logo maybe (American Institute of Professional Geologists). Foerstephyllum sp. 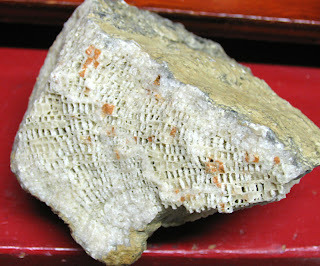 coral fossil from the Upper Ordovician Period limestone of Spencer County, Kentucky. This coral is in the phylum Cnidaria. 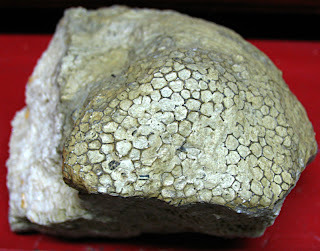 Thanks to Mary Ann for letting me photograph this fossil.